In 2009 my family and I adopted a young boy of eight-years-old and my life began to change in ways I could never have imagined. It was the hardest thing I have ever done yet it also brought me great awakening to who I really am at my core. WHEN I MET our son Keydell, I was a volunteer at the group home where he lived, here in Rhode Island. I had two beautiful children of my own who were in their early teens, was married to a wonderful man and was happy and content in my photography business. After a year of visiting the group home and spending some time with Keydell, he came up for adoption and the house manager asked me if I would consider adopting him. My heart was blown wide open with the thought of doing something like this because I hadn't thought about adopting a child, but I was excited and afraid at the same time. 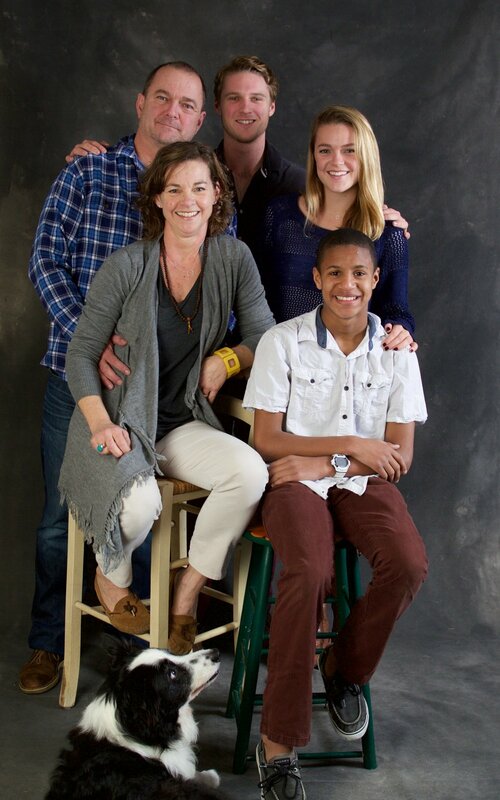 I love children and had quickly realized that Keydell was a bright, athletic and charming young man who simply needed an opportunity to thrive so my family agreed to adopt him and our lives together began. I was two years into my Buddhist studies and meditation practice at the time I met Keydell and felt I was ready for anything. Little did I know that Keydell would become my greatest spiritual teacher. I learned a lot from my Buddhist teacher, Venerable Khensur Rinpoche Lobsang Tenzin, and from my studies with His Holiness the Dalai Lama, but Keydell challenged me in ways that tested my practice of compassion, empathy, non-judgement and patience beyond what my academic mind had absorbed. Keydell suffered from RAD, reactive attachment disorder, and it caused him to have very violent, dis-regulated episodes on a regular basis. As much as I was developing my mind to be more calm and aware with my meditation practice, his mind was in a heightened stated of fight or flight, anxiousness and fearful and he could not control his outbursts. He felt alone, detached from everyone, ashamed, the fear of abandonment (again!) and unaware of his impact on others. We needed to bond with him and make him feel safe with us. After almost two years of seeking help for him, I realized we may never find it. I began to wonder how I could continue to live with this child and what it would take to do so. Could I see him with a clear lens of acceptance? I sat in meditation, opened my heart and began to fully accept who he was and where he had come from and stepped back from my need to "fix" him. I simply held space for him and opened to full love; the kind of love that fully accepts our differences and realizes our need to connect with one another and be loved fully. After a period of time he began to trust that we loved him and would be here for him no matter what. With the help of neuro-feedback, which helped calm his outbursts, and the love and acceptance from our family, Keydell became more stable and in control of his emotional responses. He was able to put in place the P.A.U.S.E.™ method I taught him, and uses it when he starts to feel stressed or overwhelmed. He now is more bonded to us, happy, successful in school and has tons of friends. I believe we can all use mindful tools to help us connect with and understand ourselves and then do the same with others. For years I have been mindful through the lens of my camera connecting with my subjects and I used my meditations and the dharma to calm myself during that rough period with Keydell; staying present to what was happening and not what I was making up in each moment. I then reflected on each episode so we could make progress towards more peace the next time there was an upset. Both Photography and mindfulness helped me practice slowing down, looking carefully outside and inside myself so I could understand the emotions I was feeling, how they effected my actions and then how I could shift my mind towards more positive thinking and actions. I know it can serve you as well. We need to understand that if we act from a place of anger, the outcome will not be good. We must shift to acting from a place of love.